Sandy Blight Junction » « Is Fun a Mark of Intelligence? There is a whole new wave of spam coming in – it’s all about growing your own body-parts from your own body-parts. Presumably this is a set-up for “live forever!” spam, coming to an in-box, soon. Some of it may be for real, too (eventually) – I saw something interesting about “you’ll never need another tooth implant” because, supposedly, they are working on growing replacement teeth by putting stem cells in the empty socket, or something. That sounds scammy, too. Joe Haldeman’s Buying Time [amzn] hypothesizes the “Stileman Process” – a deep surgical reconstruction that allows tremendous life extension at a cost of everything you have. I’m vaguely reminded of that: the problem isn’t that you need to print a heart-shaped something out of my tissue on a 3D printer, it’s that all the supporting systems that make my heart work: arteries, nerves, everything else – are also ageing and getting less reliable. The “Stileman Process” is more or less a complete everything replacement, which is how it would pretty much have to work. Someone once explained the problem of immortality (it may have been Orac?) as: imagine you want to make your car immortal. It’s possible, but there are myriad parts that wear out and each part has different failure modes, different longevity, and different interfaces to each other part. So, while you may put new shock absorbers in, the steel stud that they mount onto may be rusting, but if you replace that you need to cut the old one off and weld a new one to the frame – and what if the frame is rusting? Eventually, every part has a longevity that has to be managed individually, or you find it’s easier to get a new car when your old one collectively stops being reliable enough. With a body, of course, it’s not as simple as “oh, your heart failed, let’s tow you in and get you a new one” because while you’re sitting by the side of that metaphorical highway your neurons are dying – a problem cars don’t have. So, why am I getting this spam? 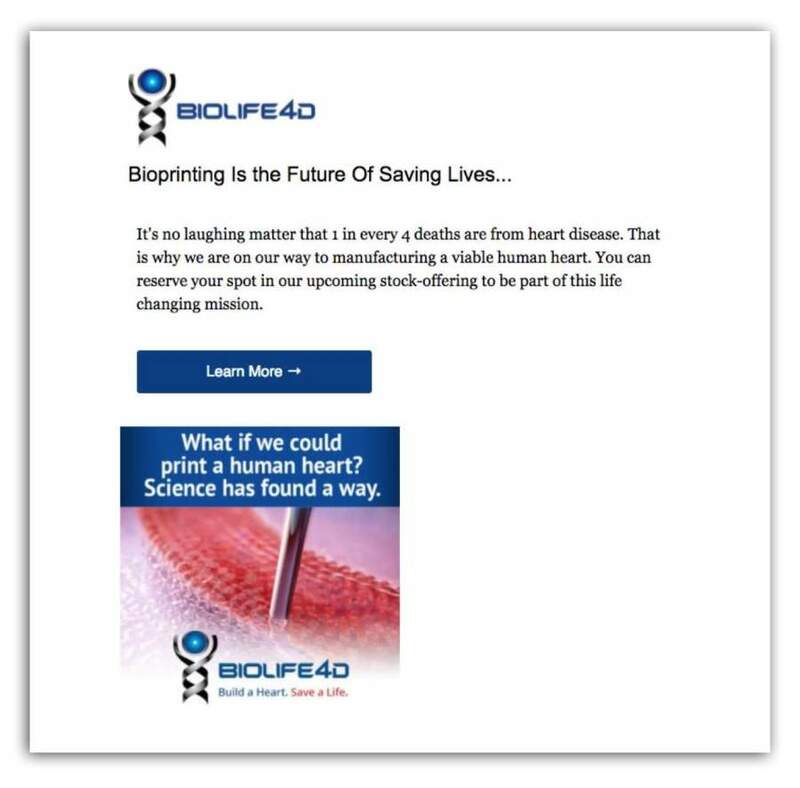 I assume that these BioLife4D guys are getting ready to float a stock offering or something like that, and the spam is a deniable way to manipulate what is doubtless looking like a garbage stock. Stock scammers do this sort of thing fairly often and it works well enough to make it worthwhile financially. Mebbe you can grow heart tissue in your tooth sockets and make your jaw pulse rhythmically. Easier chewing? Some people will fall for anything. There are plenty of parts of the body that could harbor a bit of useful erectile tissue! Use stem cells to mine for bitcoin! Still waiting on my Tactical Male Enhancement. They don’t call ’em “special forces” for nothing.